Meet Triteia, a new chemical dissolving solution that brings unprecedented accuracy, control capabilities and process quality to the field of water treatment with unique features and automatic functions for the demanding requirements of industrial processes. 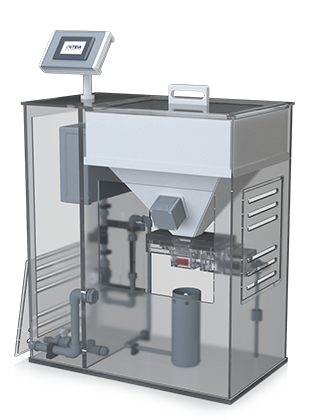 Highest level of accuracy and reliability using a unique and innovative dosing feeder together with continuous process measurements and Intelligent Automatic Control algorithms. Triteia systems comply with quality standards and are compatible with industrial processes and systems. Triteia’s standard online communications capabilities enable the integration of the chlorine solution preparation and dosage control with the whole plant control system. Easily adapted to industrial disinfection processes with emphasis on precise and safe chemical preparation and dosage. A wide range of system models for different capacity ranges Packaged in a robust, chemically-resistant design with a focus on simple and safe operation and maintenance. The main emphasis of industrial water disinfection is on the quality of the process in order to meet production requirements while also complying with industrial production standards and with safety and environmental regulations. In addition, the solution used should also promote the efficient use of water, chemicals and other production resources. Chlorination is commonly used in industrial production processes. For example, chlorination is used in food processing plants to sanitize equipment and apply germicidal protection treatment to food products during its storage and supply. The required amount of chlorination and degree of accuracy is determined according to the process stage. In pre-treatment stages (for example, the disinfecting of potato washing water after picking), a high level of disinfection is required. In contrast, during the last stage of washing fruits or vegetables before packing, a relatively low and accurately controlled dose is required to protect against the potential formation of microbial infection and possible decay while avoiding any adverse results such as affecting the flavor or packaging. Triteia systems are built to meet the strictest industrial water disinfection process requirements. Instead of using liquid hypochlorite which has many disadvantages due to its chemical properties, they use solid chlorine, which has a high and stable concentration of free chlorine. This contributes to the efficient, high-quality, controlled and reliable use of chlorine. In addition, the design and features of the Triteia systems save space and resources, ensures safe operations and streamlines transportation, storage, chemical utilization, and support plant operators in complying with environmental and safety regulations. Automatic operation and control – ideal for automatic operation according to process settings and process variables. These variables are measured internally by the Triteia system or externally using on-line measurement instruments . Control settings can be defined using the system’s HMI or remotely using Triteia’s Modbus communication capabilities. Small footprint – saves space due to compact system dimensions and design. For example, the Triteia S50 system is suitable for the disinfection of a wide water supply range (e.g. 0.5 – 300 m3/h) and for varied levels of disinfection (e.g. 0.5 – 10 ppm) but only requires an area of approximately 1 m2 for the actual system and its daily operations. Communication with the plant’s control systems – through serial communication or hardwire I/Os. QA/QC – include internal logging and simple data transfer. Sometimes, industrial water disinfection processes are characterized by several stages of disinfection in one continuous process. For example, fruits are washed in 2-3 consecutive stages, each of with involves varied chlorine doses. All Triteia systems, from the smallest to the largest, are suitable for performing chlorination at several stages of a process or for several independent processes performed in parallel. The high accuracy and resolution of the solution preparation and the wide capacity range of each system enables accurate and reliable chlorination in several stages or in different independent processes, simultaneously while operating and controlling several dosing pumps together.